There is a lot to love about Spanish cuisine. A mix of Mediterranean, American and regional influences, Spanish gastronomy provides an authentic paradise for any palate. 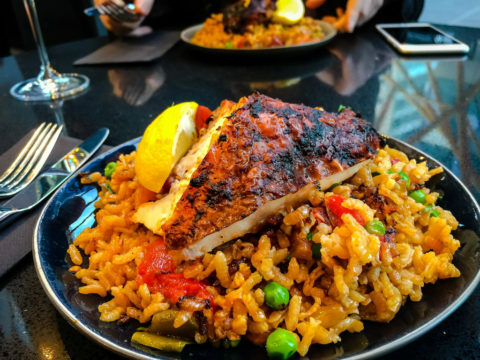 If you cana��t wait to go to Spain to savour its delicacies, check out our best restaurants for enjoying the Spanish cuisine and culture, just a few minutes walking distance from our school in Brighton. Founded in 2009 by Jorge Rodriguez and Karim Larbi, OlA� OlA� combines a lively tapas bar with a welcoming restaurant. They aim to give their clients an authentic experience, combining Spanish food and Spanish music. Try their wonderful tapas tasting menu or seafood paella, and a great sangria whilst watching the best flamenco show in the city. Just 6 minutes from our location in Brighton, OlA� OlA� is the perfect place to enjoy an entertaining Spanish evening. Aguadulce (sweet water) is a beautiful village in the Almeria Coast characterised by its Mediterranean cuisine. Thata��s where the owners of AguaDulce come from, a lovely venue divided in three sections: the tapas bar, the restaurant area and a private function room for up to 25 people. Enjoy one of their original tapas for free with a glass of wine or lager, and try their great selection of fresh seafood, meats and vegetarian dishes with an Andalucian touch. From boquerones to queso manchego or the best variety of paellas, without forgetting the great Rioja wines, your taste buds will have the chance to savour Spain very close to The Lanes. A traditional Spanish atmosphere and a highly-praised Mediterranean cuisine meet in the heart of The Lanes at Casa Don Carlos. Combine a refreshing sangria in its typical clay jar or a glass of wonderful Spanish wine, with a selection of popular choices from the varied menu such as meatballs, patatas bravas, gambas al ajillo or tortilla with chorizo. The portions are as large, as in any characteristic Spanish home, and the friendly service will definitely remind you why Spanish is such a beautiful language to learn. Why not enjoy a Spanish meal after your Spanish evening language course in Brighton? Or go before you take a Spanish language holiday in one of our many Spanish locations.